The Wellesley College archive owns boxes of America the Beautiful memorabilia and related material among the papers of Katharine Lee Bates, dating from 1866 to 1977. Bates graduated from Wellesley in 1880, and returned to teach at the College for 40 years, becoming chair of the English Department. 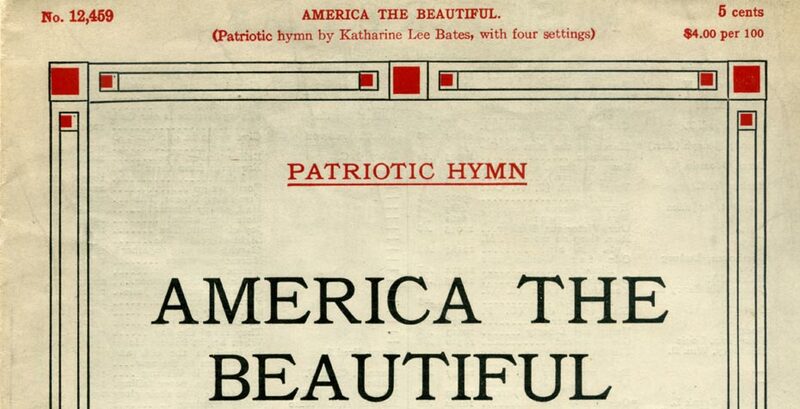 She wrote poetry and hymns as well as criticism and stories throughout her life, but none has had the longevity of America the Beautiful, which was first published as a poem on July 4, 1895. Lore has it that Bates was inspired by a cross-country railroad trip that took her to the summit of Pikes Peak. There the spacious skies let her poetic thoughts soar. The lyrics were set to music by countless composers, both professional and amateur. The tune familiar today is by Samuel Ward, but Wellesley’s archives contain dozens of scores hand inked on music worksheets by other men and women. The collection also holds diaries, correspondences, publications, scrapbooks, manuscripts, reports, memorials and tributes, all concerning “America the Beautiful” and other writings of Katharine Lee Bates, her travels, and her life at Wellesley and in her birthplace of Falmouth, Mass. Some especially charming items are letters written to Miss Bates from fourth and fifth graders in 1928 (with their enviable penmanship), a letter from a “Spanish gentleman” forwarded by New York Times editor Henry Loewenthal with a personal note of admiration, and a 1962 news story about the first satellite TV transmission from the U.S. to Europe, which broadcast “America the Beautiful” with a waving flag as video. America the Beautiful is still routinely sung during Step Singing, Convocation, and Commencement, and other occasions at Wellesley College. As called for by informal tradition, student singers bellow SISTERHOOD in place of brotherhood during a key refrain.